What is the Mapyx Tracking Solution? Tracking technology identifies the location of individuals or groups. Mapyx selects the best and most reliable technologies to develop into a comprehensive suite of products and services, giving the User the most comprehensive tracking package available. It is not merely a product but a full service solution providing the User with as much or little help as required. The Mapyx Tracking Solution is a fully integrated bespoke mapping and tracking system designed for the outdoor use. Originally, it was developed for search and rescue operations; subsequently it was developed specifically for outdoor education and has further evolved since its launch in 2010 to respond to specific users requests. The Mapyx Tracking Solution is in use with Mountain Rescue, Lowland Rescue, the Ministry of Defence, Fire Services, Schools and Council. It has been used for expeditions and events around the world and even for TV work by the BBC and Channel 4. We have tracked people all over the UK, reliably and safely, as well as further afield such as Everest, Kathmandu, Bhutan, India, Greenland, USA, Eastern Europe, to name but a few. The Mapyx solution is a fully developed and integrated, which consists of software, hardware and full support solutions. It is not a single component, but multiple components that the User can select, depending upon their needs; of course, our recommendation is for the User to have all components to hand, so that they have maximum coverage and support. Teaching map reading, route planning and printing maps. 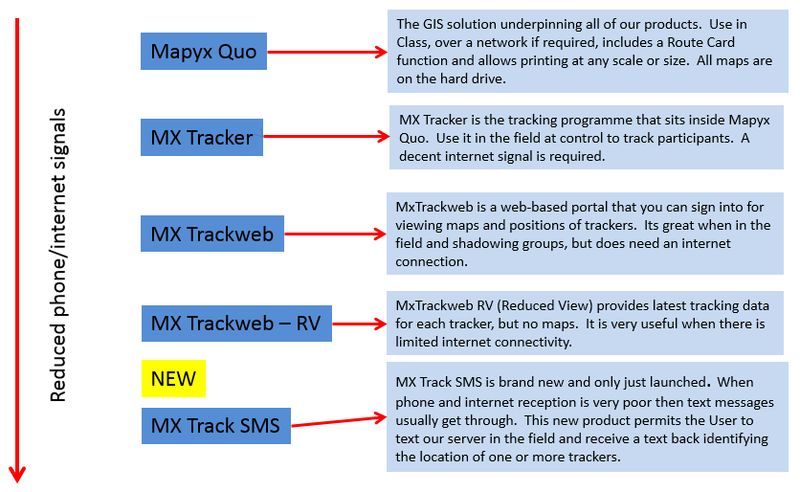 Our full Tracking Control Solution integrated within Mapyx Quo for viewing Maps and Trackers. Our cross-platform web enabled solution which you can use for viewing Maps and Tracking on your I-phone, Android, tablet, etc. Tracking in the field (limited internet). As above, but without the maps but provides the latest positions of your Trackers. Tracking in the field (no internet). Our new Solution which allows the User to text to our server and it texts back one or all Tracker positions. Initially via GEOS, the International Emergency Response Coordination Center (IERCC), based in the USA and subsequently the UK Aeronautical rescue Coordination Centre (ARCC). Additional Emergency Help & Support UK only. We receive notification of every SOS, 24 hours a day, every day of the year. We usually intervene immediately since we have much greater data than GEOS and regularly are in contact with UK ARCC. An internet signal is required to get the best out of the solution, but we have designed our solutions to have full-back-up, even when little or no internet signal is available. The latest introduction to our solution is our MX Track SMS which gives you the ability to get Tracker positions via a text message; in our experience, text messages usually get through in most UK locations. The below graphic how we recommend utilising our solutions. All of our solutions go through thorough testing by a group of Users, who regularly provide feedback on product improvements and test results. Initially we test our software internally and once satisfied, we pass our test software to our key beta testers who are mainly part of Mountain Rescue Teams, who perhaps place demands on our software greater than schools, so make the ideal testers. 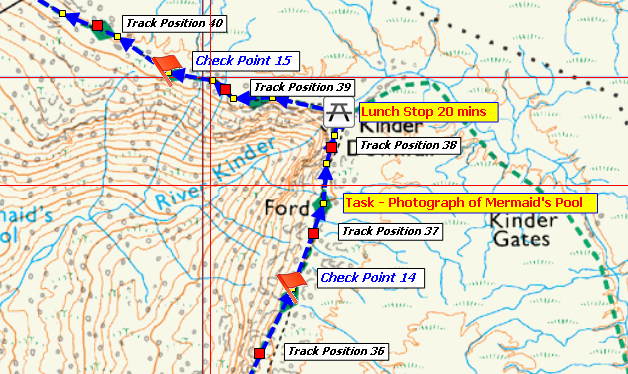 By example, our new MX Track SMS was first tested in 2014 and tested more recently by Sutton Valance School who provided the following feed-back: "We used it in earnest up in the Lake District with three different people. It was brilliant - it solved an issue with internet connectivity and once I had set up the individuals it worked fantastically. Overall, a very successful trial and we will definitely be continuing to use it to augment the Mapyx web site and quo tracking." So by the time our solutions reach you, we have every confidence that they are useful and deliver a proven solution. 1. Our staff are actively involved in education, DofE and rescue services, so understand the fundamental requirements of a comprehensive and usable tracking system. We don't just design software, we actually use it and train people how to use it. 2. We design and test our solutions fully. If you need assistance you can get it 24 hours a day, throughout the year. 3. Our solutions are designed to be robust and NOT fully dependent upon internet connections. 4. We use Ordnance Survey Mapping and NOT Google Maps, which are of limited use in the outdoor environment. 5. Our maps are NOT streamed onto a computer so full mapping data is always available, even without an internet connection. 6. Our solutions are complimentary and scalable; they integrate together and you can add more as you see fit. 7. We recommend satellite tracking devices since they are reliable and work all over the UK and the rest of the world. We have designed and do use GSM/GPRS/Radio Tracking at times, but they do not deliver consistent and reliable data streams. We only sell what we know works. 8. We can and do design our solutions to work with the best satellite tracking systems in the market place; so by example, whilst we favour 'Spot' Tracking devices, then equally our solutions will work with other Trackers; we listen to our Clients and recommend the best solution. We do not restrict ourselves to any specific satellite or other technology; we provide what the User requires, so by example, one professional user utilises radio tracking. 9. For most expeditions, we generally recommend the Spot Satellite Trackers. There are over 250,000 units in use around the world, so they are well proven and reliable. a. Mountain Rescue England & Wales Official GIS & Digital Mapping Partner. b. British Cave Rescue Council Official GIS & Digital Mapping Partner. c. Search & Rescue Dog Association Exclusive Official Mapping Partner. d. Association of Lowland Search & Rescue Exclusive Official Mapping Partner. e. Ordnance Survey, Ordnance Survey Ireland, Ordnance Survey Northern Ireland & Land & Property Services Official Partner. f. Official MOD Contractor and Supplier. g. RAF Mountain Rescue Service Supplier. h. Official GIS & Digital Mapping partner to Plas y Brenin, the National Mountain Centre. i. Supplier to the RAF Air Defence Air Traffic Systems Group. j. Supplier to hundreds of Schools, Councils, Cadet Forces. Simply put, we have a unique market offering with full service back-up. If you are interested in Tracking and want to chat it over, then simply give us a call on 01392 241 428 and we will be pleased to answer your questions. Ask for Steve or James, who will be pleased to answer your questions. Alternatively, just email us at info@mapyx.com.